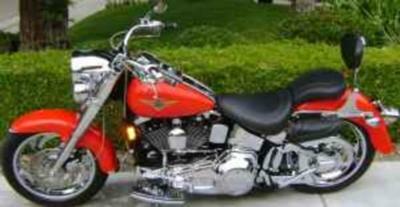 The 1998 Harley Fatboy has braided cables, running lights in front, chrome upper and lower belts, a Thunder Header Exhaust, an extra Seat, Sissy Bar, Windshield and Arlen Ness Wheels. This Harley Davidson Fatboy has mirrors with turn Signal, Highway Floor Boards, and lots of chrome with low mileage of only 16,000 miles on it after it was overhauled and owner has all paperwork with documentation. Every biker knows that the Harley Davidson Fatboy is one of the biggest hits with motorcycle enthusiasts to ever roll out of their studio. Each of the Harley families has an iconic model that really stands out in the crowd and the Fat Boy is that bike in the Softail family due to the multitude of distinctive features completing the already unique American style. This particular custom Harley Davidson Fatboy is a rolling work of art and is ready to hit the road. I would be happy to respond to any questions and consider all offers if you will contact me using the space below that has been provided by Strike Lightning Used Harley Davidson Motorcycles for Sale (and PLEASE do not neglect to include your contact information in your email or to provide a phone number or email address!) so that I can respond with answers to your questions or after consideration of your best offer as quickly as possible. You won't find a sharper looking, low mileage Harley Davidson FATBOY for sale in California, on Craigslist or in an Ebay auction so hurry and make an offer before it gets away from you! Strike Lightning would also encourage bikers to submit a review of the 1998 Harley Fatboy to make the biker community aware of any problems that are commonly associated with the or to highlight its positive features and help potential buyers make informed decisions. This is a great buy with a reduced price tag of only $11,500 and low mileage!